Yogic diet reflects the first principle of yoga, Ahimsa. According to yogis, a healthy diet brings NO HARM to any conscious living being. Therefore, a yogic diet is a vegetarian diet. or to allow your own body deteriorate from lack of food?" Vegan diet causes the least harm to our body, to our animal brothers and sisters, and to the health of the planet. I would not advise this choice to everyone right away, but, in my humble opinion, vegan diet is the most yogic diet. I would advise to try it for a few weeks. Second guideline in the Yogic Diet is to avoid heavily processed and over-stimulating foods and beverages. The goal of yoga is stilling the mind. Anything that disturbs the peace of mind, or brings a violent reaction in the body, should be avoided. Thus, the yogic diet is fairly bland for Western taste buds. Any heavily processed and over-stimulating foods such as hot peppers, garlic, onion, strong spices, processed sugar foods, and alcohol are avoided. In India, the yogic diet includes dairy products because, normally, the milk comes from a cow who receives plenty of love and care in her life. Thus, the cow's milk contains the love and the care, and is healing to the body, according to Ayurveda, the traditional medical system of India. In the West, cow's milk comes from dairy farms, few of which are free-range and organic. This means that the cows are kept in tiny stalls all of their lives, given unnatural corn-meal as 'food', receive no love and care, and kept impregnated over and over to be lactating to produce the milk. What kind of energy does that milk contain? When we buy a carton of milk in the supermarket, it may contain the milk of hundreds of different cows. 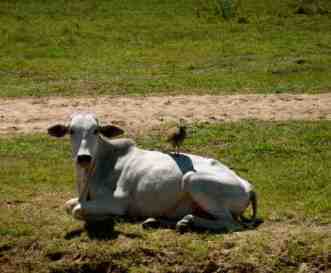 Cow's milk in India comes from one cow. In the West, the milk contains antibiotics and growth hormones to keep the cows 'healthy' and produce more milk. In India, the milk is just the milk. In the West, the milk is pasteurized to kill any healthy and unhealthy bacteria. The healthy kind helps to digest the milk proteins. Without that healthy bacteria, the milk is practically indigestible by most people (hence, lactose-intolerant). And finally, what happens to the calves who are born when the mother cows give birth all the time? In India, the calves hang out with their moms. In the West, they are taken to the slaughterhouse as part of the lucrative Veal Industry. So in the end, diary products are not that peaceful after all. This begs a question: Should the Yogic Diet really include dairy? Unless you are in India, or have your own cow, or have access to a happy cow's raw milk, skip the dairy. But don't be violent to your own body either, so phase it out gradually. Finally, the Yogic Diet also refers to the way we eat. To eat slowly, mindfully, chewing the food until you can drink each bite, savoring the flavors, smelling the aromas, and breathing calmly.